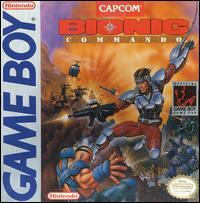 Bionic Commando is an action-platformer for the GameBoy, released originally in 1992, and rereleased for the 3DS Virtual Console in December 2011. 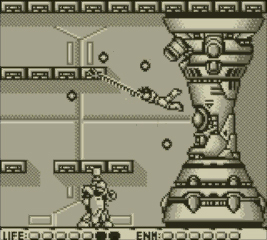 In any Bionic Commando game, the hook is that you use your bionic arm to platform around the stages. There is no jumping in this game. It's a great change of pace from almost every other retro platformer, and you'll learn to love it immediately. The mechanics are also simpler, and therefore better, than the recent remake Bionic Commando Rearmed (XBLA/PSN/PC). Swinging to get around is very fun. In Bionic Commando, the story plots you as a hero off to challenge an evil group of terrorists bent on world destruction. Straight to the point and all for the better. The action segments are fairly robust, with a few different enemy types. 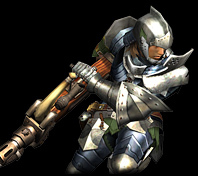 Boss battles all play out similarly, though there is always a different obstacle to get past during these battles. There are a variety of guns, equipment, and radios, that unlock as your progress in the game, keeping things interesting. You're rewarded for exploration and clever bionic arm swinging with extra lives. On the downside, sometimes you'll struggle with the rather zoomed-in view of the action, not knowing what's beyond a slight scroll of the screen. Pro tip: keep shooting while running forward. Graphics are detailed and pleasant to look at - definitely looks good. The music and sound effects are quite well done for a GameBoy game. I still have some tunes stuck in my head from a few days ago. Boss battles can get pretty hectic. In terms of challenge, there's a good one to be had here. I made extensive use of the 3DS' save-state function, though you do get supplied with quite a few continues and extra lives. The last segment of the game in particular would be hair-pulling without the save-state, in my opinion. The game's length is appropriate. In conclusion, whether you're in the mood for a solid old-school action-platformer, or if you're fed up with Nintendo's paltry recent 3DS Virtual Console offerings, this is definitely a game to go back and check out if you missed its release late last year. But yeah, been meaning to try this out. I was really hoping it would get voted for a Retro Game Club, but it didn't get many votes last time so chances look slim. The grappling system had way too many quirks in BC Rearmed. Momentum is one thing, but you had to mash the dpad to get certain swings to work properly as well, and it sucked. I 100%ed the bonus rooms in that game, God it was a nightmare but I did it. Ha, I remember getting like halfway through the bonus rooms and being so frustrated at one that was basically a vertical climb up single grapple points that couldn't just be reached up through each other for some reason. Don't remember if I went back and completed them or not. Kinda doubt it. BCR2 rooms were so easy, though, and there were only like 30 of them or something. BCR2 was good, worth the $15 I'd say, but the first Rearmed was still better. This game looks good. I'll prabably buy it during a slow week (which is pretty much every week). I freaking loved Rearmed, by the way. I think it's an excellent example of how to do a remake. Bionic Commando never had a jump, ever. Only the sequel of the remake did, and it was a mistake. I played the heck out of the original NES game back in the day but never tried any of the sequels. Good to know this one is decent and available on 3DS. @Simbabbad I actually kind of liked the jump in BCR2. Gave movement more of a flow, less rigid. Plus, at least it was optional. The level design and enemies and weapons were all big downgrades, though. I know, I never said it did. I have the first PS3 game and although I understand why it doesn't have a jump button, that type of platforming just doesn't work for me. I spent like an hour playing, always feeling like I was battling the controls, and then I stopped and never really went back. Thanks for the review @anon_mastermind, this is a game I know I've been wanting to download for my 3DS, it's just a matter of making the time for it! Rearmed was kind of cool, and kudos on 100%'ing the bonus rooms. Those frustrated the hell out of me. I've always loved the challenge of not being able to jump (introduced in the original NES game), instead forcing you to use the bionic arm to skillfully maneuver the environments in creative ways. I had trouble with the controls too, so I switched to easy (which filled in a lot of the pits with blocks and made it basically impossible to die from falling) and finished the game that way. I'm tempted to give the GB version a try since I want a new game and there really wasn't much released on eShop this week. To be fair, the controls were a tad over-complicated in BC Rearmed. The swing mechanics were not that straightforward. The GameBoy game's mechanics are more intuitive. I've never played the original NES Bionic Commando, actually. I wonder why it never showed up on the VC. Go for it. Hopefully if it sells well enough, Capcom will release the sequel, a GameBoy Color game. I'm pretty sure that this game was also the foundation for BC: Elite Forces. I think most people assume that BC:EF is a remake of the original, but I think it's actually a remake of the GB version. The music compositions at least, are the same I believe. This game has a GREAT soundtrack. I assume then that the GB version's music is also pretty awesome. It's not a remake, but yeah the music is the same good stuff. Bought it the other day and I'm just outside the Albatross. I'm not really sure how the controls are so different from Rearmed, but I guess it's been a while since I played it. Really, the game seems like a de-make of Rearmed (which makes sense, I guess, since the GB game is an adaptation of the NES game, and Rearmed was a remake of that). To be honest, I'm a little disappointed that it's all so familiar and comparatively simple, but I guess I should have expected that. Still, it's way cooler than most Game Boy games were back in the day, and worth $4 to satisfy my curiosity. It doesn't have the bells and whistles of Rearmed, but you don't find the mechanics to be simpler? I find I don't miss my jumps as often in Bionic Commando GB. It is indeed quite solid for a GB game. So this is different than the NES version? Hmmm, may need to give it a whirl. I 100%'d the bonus rooms in BC: Rearmed too, and that was miserable, especially the last few. @anon_mastermind Hmm, you may be right. Like I said, I basically haven't played Rearmed since it came out, so some of the finer points of movement in that game may have escaped me. I guess I just sort of assumed the mechanics were the same, and I was attributing the intuitiveness of the GB game to my familiarity with the series rather than better controls. I do remember having a particularly tough time learning to swing in Rearmed, but I've since assumed it was just because that was my first Bionic Commando experience. @ludist210 I haven't played the NES game myself, but the similarities between Bionic Commando GB and BC Rearmed lead me to believe that the GB game was a sort-of-port of the NES game. It has a sci-fi anime look to it, but a lot of the level designs look familiar to me. I wonder if they'll bring Elite Forces to the 3DS VC. I could never find a copy that didn't freeze up, for some reason. I actually exchanged my GBA multiple times because I thought it was a hardware issue.